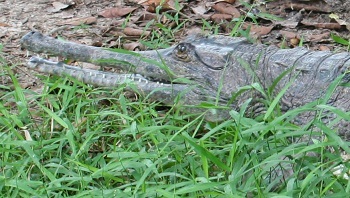 It was said that the crocodile was a False Gharial, or Tomistoma Schlegelii (the crocodile which has a long pointed snout). 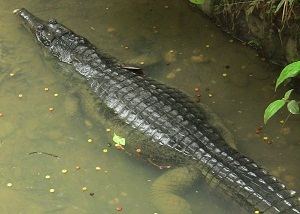 This picture was taken at a crocodile breeding farm in Jambi. According to legends, this woman was to have been the wife of a former sultan/king. You can read our translated legend about this woman with this link, as well as read about her sacred grave with this link. This picture was taken at the arboretum in the City of Bangko–western side of the Jambi Province. Although the large majority of Indonesians confess the Islamic religion, their form of Islam is often intermingled with lingering beliefs from former eras, when Hinduism, Buddhism, and animism was dominant. This is clearly seen through this one event that took place a few years ago. While fishing in the lake named Danau Sipin, some men found a 6’ crocodile tangled up in their fish nets. They noticed something strange about the crocodile, in that it appeared to have bandages wrapped around its body. 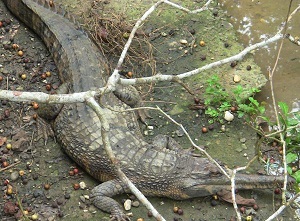 The fishermen untangled the crocodile and released it back into the lake. After that a number of people in the community began going into trances, and they developed the belief that Putri Ayu had reincarnated into that crocodile. The Jambi community has immortalized Putri Ayu and even considers her grave to be sacred, in that if people pray to her there, they will receive great spiritual blessings. 1 Source of the original story. 2We asked several of the cemetery caretakers where this crocodile was to have been buried, and they expressed surprise, because they had never heard of the event, nor did they know of a crocodile that was ever buried in that graveyard. One lady we spoke with, Ibu Sopia, said she was the 5th descendant from Putri Ayu.